The actress welcomed a baby boy around 7:45 yesterday morning Friday May 31 in New York. Congrats to her! Wow that great on my birthday !!! Congrats to her and her American citizen! Am so happy 4 her! Wow that great on my Birthday Concon!!! What's wiv all dis peeps going abroad to deliver their baby(s)? What happened to our hospitals in Nigeria? Congrats 2 her....Olumide Bakare(confirm Grandpa)!!! Two kids, two husbands what a great achievement. Congrats! Mother & baby smiling...me likey. It’s a few more days to the most anticipated Student Fashion Week in Nigeria. The Nigerian Student Fashion and Design Week is scheduled to hold on the 7th & 8th June, 2013 at the Indoor Sports Hall, University of Lagos, Akoka. Congrats Laide. Baby welcome to our world. God bless you n keep u nd ur sister. Congrats. So who is the baby's daddy? Congrats but am not proud of u.
Hmmm.... 9 months ago while still married to her ex - husband. you claim he was married so decided to commit adultery by sleeping with another man!! I wish the innocent baby well- good health, long life and a good future!! And who's d father? ?Old or new hubby?? ?Laide abeg tell us who to congratulate jor!! Congratulations. God bless and protect the new born. 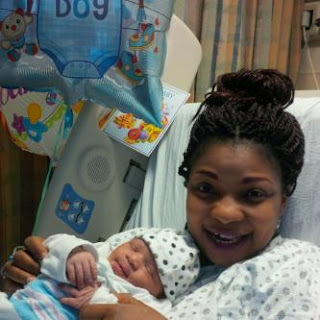 i'm so happy 4 her... Laide congrats ooo..
Na party labour catch am abi she intentionally put on make up 2 go born? Congarats laide. Eh! So she was already pregnant when she re-married. Such a beautiful baby. Congrats 2 her Απϑ hubby. Congrats ke? Tot she's divorced .. Who give her belle? @anon 11:16am You should leave the us also. Try having a child at any government hospitals with all the major facilities in Nigeria and tell me you won't regret your life. I went to a hospital 28wks pregnant with a healthy active pregnancy and left a few days later with no baby! Due to a simple careless mistake from the doctors. So preach your silliness elsewhere or when it's ur turn to have kids, you can deliver in mushin. EveryOne Has his Or her cross to bear. Am sure d mother knows d father of her baby.cute baby u are welcom. Maternal mortality rate is sky high? Plus blue passport tinz... clear enough? Who giv kim k belle? American Citizen, like u British Citizen! Congrats dear, but I'm not proud of u! 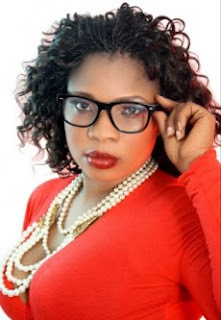 Ignoramus learner, Olumide Bakare is not her Father. They are not even related. Isn't it obvious enough? For the best medical care.. Abi who wants to die at childbirth..
Hypocrites.. Like you won't jump at the chance..
What a senseless comment.. You hate so much that you look for negative things to say.. Oshi.. I don't know why Linda allowed this sort of people here to comment any how, but she won't post sensible ones..
All you haters, stop hitting on those that are wise enough to give birth abroad. If I was delivered in Naija, I would have died. The stupid UCH wanted to terminate my life while in the womb! What's with telling a married woman to abort her baby? Congratulations Laide...wow! He's so cute!!! anon 4.18pm...stop hating.i m sure if u had the opportunity to have ur baby abroad,u'll grab it.ur comment makes no sense,whether u like it or not,the baby is a citizen of God's own country..U berra wish pple well so that good things can come to u. @Anon u are free to ur opinion just as I am free to mine too.